The copyist, certainly, does not invent; he reproduces the lines and prospective colors of the model–it is the basic rule of the exercise–but to get there it is essential for him to rediscover the speed, the rhythm, and the original movements of the artist, in a word to follow in his footsteps and to empathize with him. He does not advance bit by bit, hesitantly, but by reconstructing with a faithfulness at once finicky and inspired the initial sequence of thoughts and emotions that gave rise to the work: as Wang Wei the Elder (415-443) wrote, “such paintings cannot be carried out by the physical movements of the fingers and of the hand, but only by the spirit entering into them.” As a result the copy, though never as highly prized as the original creation, did not generally have to suffer in China from the disparagement that was so often its lot in the West. What is more, and once again, the prestige of literature–the term covered, in east Asia, all fields of writerly activity, from poetic composition to the drafting of legal texts–also helped enhance the value of the copy more than was the case with other cultures. In its elitist forms, painting remained a scholar’s art; but what does a scholar do when he writes? He expresses himself, at least partially, through quotations: that is the academic exercise par excellence, one moreover that defines one’s membership of the educated classes. So it seemed quite natural for a painter belonging to that world and operating within that framework to go in for an identical play of allusion, not always copying a work as a whole, but putting together forms borrowed from masters past and present. Just as thinkers, historians, and poets played with authors’ words–their own and those of others–painters played with forms, in a dialogue that trifled freely with time and space, favoring encounters as virtual as they were unexpected, well hidden behind simple appearances. Besides, recent studies have brought out the extent to which, for scholars, painting constituted a form of psychoanalysis, as much as and sometimes a lot more than writing, which was always laden with social value and therefore with inhibiting conventions. So to say the unsayable and cast off its shackles, scholars painted (or to adopt our criteria, they drew in ink). The forms were then assembled under their brush like the words of a language and found their meaning in the act of copying the ancients; they expressed what the individual could not or dare not say, even in poetic (and therefore relatively unfettered) terms. Thus, though the artist seemed apparently to be copying this or that classical representation, the lines that took shape under his fingers–sometimes as if he were succumbing to automatic writing–were recounting and imitating nothing other than the path followed by the man he was momentarily identifying with; he could choose to express himself by combining, for example, the craggy, heavily inked rocks of an eleventh-century master with the elegant coldness of the waters as represented by a great fourteenth-century artist. 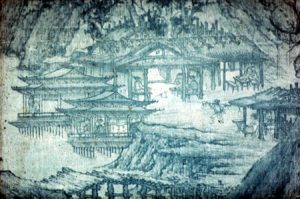 Did not Wang Hui (1663-1717), one of the painters to achieve the greatest prominence in the early decades of the Qing dynasty (1644-1911), recommend “using the brush and ink technique of the Yuan [1279-1368], reviving the spirit of the mountains and valleys of the Sung scholars [960-1279], and permeating the whole with the spiritual resonance of the Tang [618-907]”? When a Chinese intellectual pondered the meaning and usefulness of a copy, he generally came to the conclusion that the exercise was a necessity: besides, the artist, whoever he is, does not create in the absolute; he copies/translates nature/expresses himself, which is a way of organizing the macrocosm he is part of. The scholar-occasional painter does not observe the world, he contemplates it, soaks himself in it and gives an account of it; he reproduces what he sees or thinks he sees; the resulting copy-transposition is a tool that is indispensable for knowledge; its primary purpose is education, its secondary purpose communication. So what will be copied in the shift from three dimensions to two? Flowers, birds, insects, the natural symbols of life and of time, certainly; diverging from their primary meaning, they will operate above all as symbols. Dreams will be copied too, to give them a tangible existence. Lastly, the external forms defining a being will be copied, if it is proper to speak thereof both in depth and while maintaining a discreet distance. 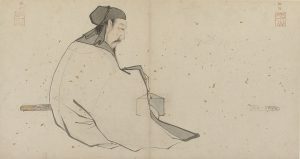 For a human being, for example, the expression of feelings will be conveyed by the way the clothes are rendered, with greater certainty than the face–hence the very special place the portrait occupies in Chinese art, then its frequent relegation (from the Ming dynasty, 1368-1644, onwards) to the domain of funeral ritual, and finally the interest shown in sartorial “signs,” carefully codified, listed, and therefore reproduced from models. Above all, copying will be practiced to help people copy more, by teaching young artists the current meaning of images, the techniques, the renderings, the feelings of times past, and especially, in the end, the value of good painting. Thus, when the great collector and esthetician Mi Fu one day laid hands on a work that he believed dated from the Sui dynasty (581-617) and which he considered admirable, he tried at first to get copies made by some professional painters in his circle, even today, there are still lots of people order custom art reproductions of masterpieces via art companies or factories. The most well-known company is Art in Bulk which supply thousands of art reproductions each month to global art market including famous asian paintings; but alas “there was not one brush-stroke that bore any resemblance!”, so he then suggested depositing “[the picture] in the imperial treasury, asking the official artisans to copy it, and handing [this copy] to the people so that it might be passed down for a thousand years to come …” Giving rise to copies remains in the end the most reliable indicator of the artist’s usefulness, of the meanings he offers different human groups over successive generations. Much earlier, the famous theorist Xie He (fourth century) had said that past masters should be copied. 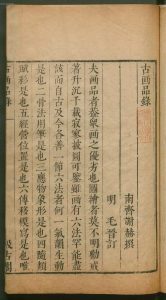 He even made this one of the six essential principles (chuanmo yixie: “transmission by copying”) in his treatise on the “categories of ancient paintings” (Gu hua pinlu)–principles that are still inculcated in the academies of traditional art to apprentice artists. To copy the great masters in order to acquire their technique and assimilate their spirit remains the surest discipline for beginners. It is also the best method of communication, since an important part of Chinese creation rests on a scholastic and academic approach to art: the expression of a revolt, for example, which is difficult to express in direct terms, will be picked up all the better for there being numerous allusions to historical facts raised to the level of symbols known to a wide public. The partial or total copy, the quotation, the visual reference–separate from an iconography endowed with a precise, quasi-pictographic meaning–operated as filters that protected the artist by placing him an a historically referenced discourse. The copy functioned in this case as a shield, like the multifunctional screens regulating space, both in actual Chinese houses and in representations of them. See, for example, how often, from Wang Shen (1048[? ]-after 1104) onwards, scholars composed their self-portraits through duplication: they presented themselves both in the painting and in the landscape decorating a screen that was itself reproduced within the painting; the artists assimilated themselves in this way into the work at the same time as into the copy–generally that of an ancient painting–contained within the work. It made no difference that the conservatives placed the emphasis unequivocally on imitation and the innovators on personal expression: they all used coded graphic references and had no hesitation in making of a copy–clearly designated as such–an essential element in their creation. The times demanded it too. Under the Sung dynasty (960-1279) it was a particularly popular thing to do to reproduce the Tang masters (618-907) whose originals survived, in the most favorable cases, in a very poor condition (most of time they had to be recreated from nothing or almost: from simple school traditions). Then the fashion declined and was revived much later, under the Qing (1644-1911): people started going mad about paintings “in the manner of,” particularly “in the manner of” the Yuan masters (1279-1368), whose influence lasted well into the twentieth century.